Have you ever watched Prairie Farm Report? 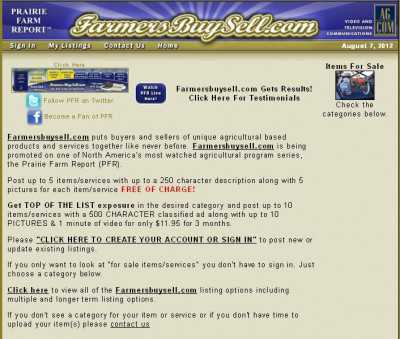 If you have, then the name of FarmersBuySell.com is one that you’ll be familiarized with. 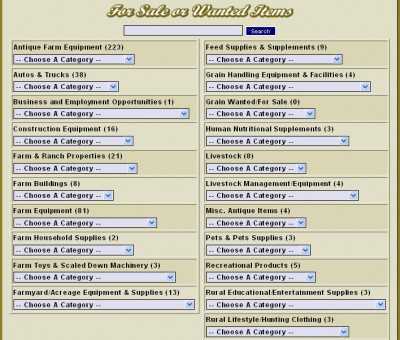 The site lets you buy and sell all kind of farm equipment and vehicles. You can browse through all the agricultural-based products and services that are listed on its pages for free, and creating an account also costs nothing. You’ll need to sign up for one if you want to buy anything, or if you want to create a listing of your own. You can post as many as 5 items/services with a character description of up to 250 characters, and 5 pictures per listing at no cost. And if you want extra exposure (or the chance to use a larger number of pictures) then you can pay a small fee, and include as many images as you want. Tractors, grain bins, construction equipment, livestock, human nutritional supplements… you will find all that on FarmersBuySell.com. The site is made up of more than 15 different categories, so that finding what you want will never take you long. When all is said and done, FarmerBuySell.com is one of the most practical ways for farmers and providers of agricultural services to buy and sell related products and services, and (also) to create some fresh business opportunities.